Trap, big-booty twerking, and an alien invasion? Who would’ve thought this would make a combination? 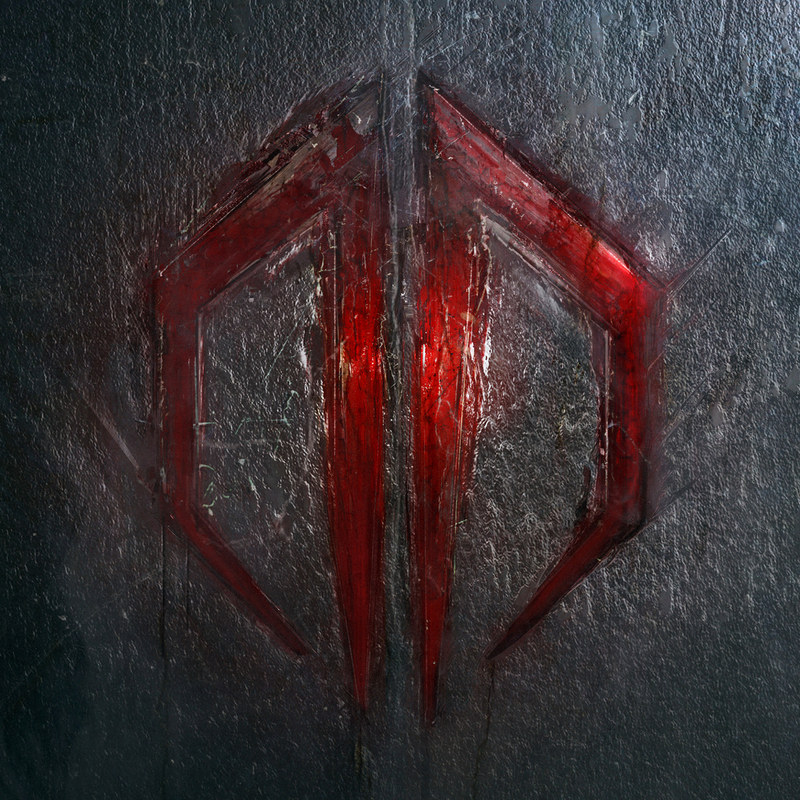 Well, Destroid is launching a series of viral videos, the first of which released today. This short, minute-long video features two girls twerking on camera when the DESTROID Bass-Ship crashes into their backyard. The spaceship’s portal opens and you see Excision, Downlink and KJ Sawka in full robot-alien gear. “The Executioner” is a video-mapping masterwork that displays an impressive 420 square feet of world-class, true-3D, video-mapped animations guaranteed to daze and amaze fans. 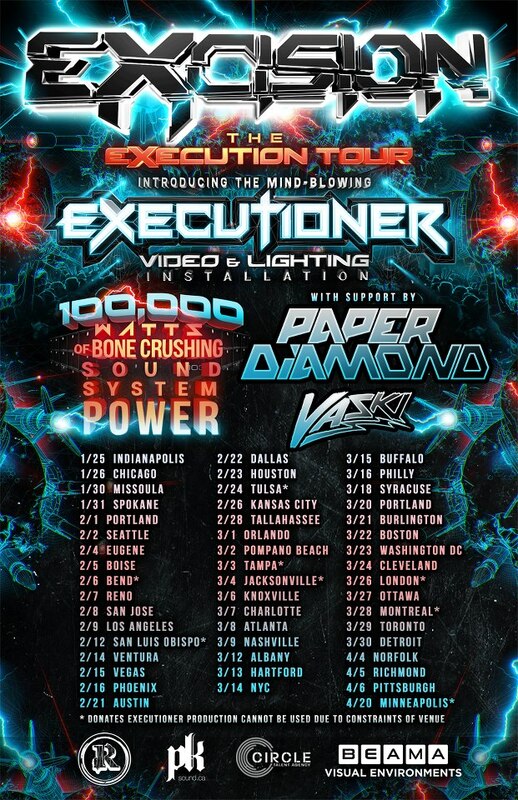 “The Executioner” will include the greatest projector available in the world and cast some of the most intricate and amazing animations available today onto a mechanical bunker in which EXCISION will perform a live set that will simultaneously sync audio with video using groundbreaking technology. Excision is revving up the audio experience and has invited back Canada’s PK Sound—which worked with him on the sold-out 2012 “X Tour”—as the official audio provider for the “Execution Tour,” packing more than 100,000 watts of full-on bone-crushing sound. For tour dates and tickets click HERE. CONTESTS || SHRAPNEL STREETWEAR GIVEAWAY! Let’s face it. The electronic music scene is now the new mainstream. 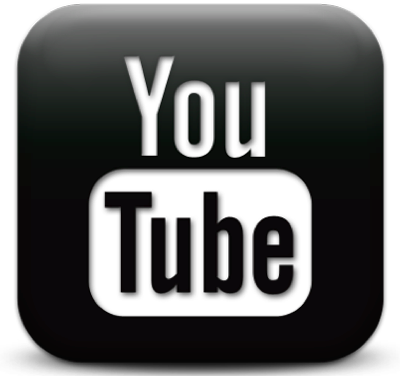 Electronic Dance Music as we all know it as has invaded virtually every traditional music genre ranging from rock to hip hop/pop. The music itself has been played by some of those most unfamiliar faces in the most unexpected settings. Every relative market now wants a piece of the mainstream cake. No one more than those who will equip you with an unforgettable show or festival experience. EDM-inspired clothing lines are popping up everywhere and are becoming a raver’s go-to place before stepping foot onto the dance floor. Sure, standard block fonts on plain t-shirts spelling humorous sayings may seem appealing to most, but they fail to capture the energy of the music that you truly live for. Let us introduce Shrapnel Streetwear. This BASS-inspired clothing line is unlike any other as its unique designs mimic the explosiveness of heavy bass music and give it a whole new meaning. With the Shrapnel 2013 collection, the brand strives to further define street fashion from within the Bass Music culture. From New Era snapbacks to cutting edge all over printed tees, Shrapnel has expanded its focus well beyond its striking graphic designs and 3D graphics. Strong supporters of the Shrapnel line include dubstep heavywieghts Excision, Liquid Stranger, Ajapai, Killbot, and many more. Brolic Beats (powered by FiXT Publicity), is proud to present an opportunity for one of you to win a Shrapnel t-shirt of your choice! Simply enter your name and email address below the break and you will automatically be entered to win! Contest ends Thursday, March 7th. Yesterday Datsik released his new EP called “Cold Blooded EP” on Firepower Records. 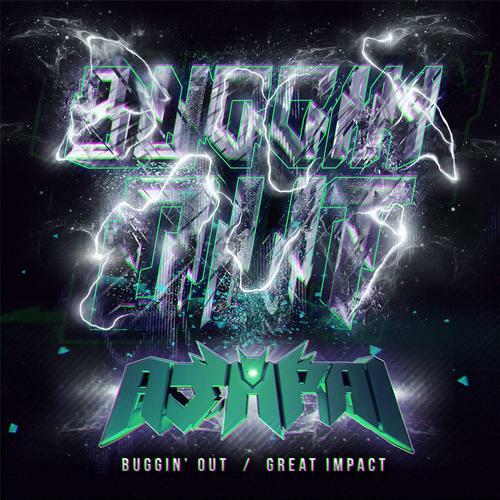 The EP features 7 tracks, some singles by Datsik, and some collaborations with artists like Excision, Messinian, Snak the Ripper, and Young Sin. Listen to the EP below! 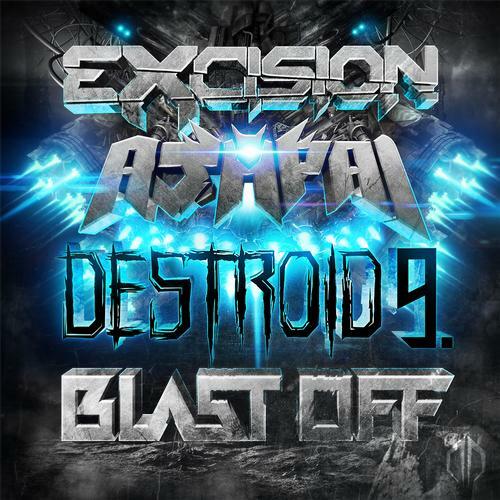 Excision and Ajapai team up on Destroid Music and came out with a sick new track called “Blast Off”. Listen to the highly anticipated track below! Buy the track on Beatport. This track is not new its almost a year old, but there has been no good dub releases recently so I decided to post this one up. 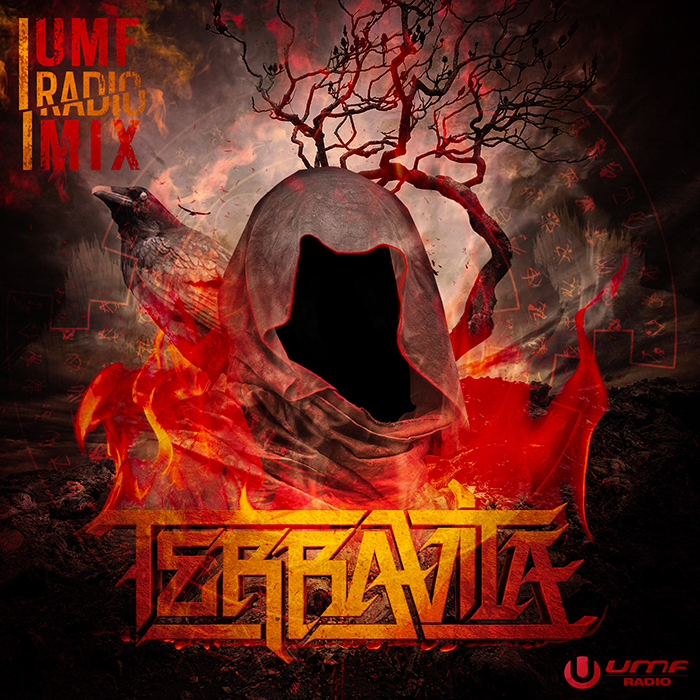 Don’t look past it, it was included in Excision’s Shambhala 2012 mix.